"Bull doesn't just map the landscapes of the Peak District (both the white Peak and the Dark Peak) but also the cultural history as well in both pop ("The League of Gentleman") and high culture (DeFoe and de Loutherbourg). It's an interesting social history of an area that is as rich culturally and historically as it is physically." The Peak District was Britain’s first National Park and the “breathing space” for people in the great cities of the industrial north. Prehistoric man built stone circles at Stanton-in-the-Moor and Arbor Low and the Romans had garrisons here, but for many centuries the region was regarded as a “howling wilderness”, exploited by its aristocratic landlords for hunting, sheep-raising, lead-mining and the stone used to build great houses such as Chatsworth and Haddon Hall and ancient parish churches in Tideswell and Bakewell.The River Dove was the inspiration for Charles Cotton’s continuation of the Compleat Angler and the Peak’s rivers turned the wheels that drove the country’s earliest textile mills. Later, its water supplied the needs of the new cities through reservoirs at Longdendale and Derwent. 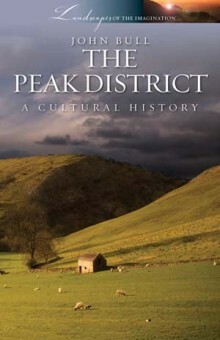 Soon the Peak District was “discovered” by writers and travellers seeking an unspoilt refuge from urban life. As railways made the area more accessible, demands by walkers and climbers for greater access to the moors led to historic clashes such as the Mass Trespass of the 1930s. John Bull explores the culture and history of the two landscapes of the Dark and White Peak, which annually attract millions of visitors seeking tranquillity, spectacular beauty and a chance to visit an area where ancient traditions and cultural distinctiveness live on. ROCKS AND WATER: spectacular scenery and wild moorland; caverns and chasms; mines and quarries; rain, rivers and curative spa waters. LITERARY ECHOES: Chatsworth and Jane Austen’s “Pemberley”; romantic and gothic fiction from Charlotte Bronte and Conan Doyle to Hilary Mantel. STRUGGLE AND CHANGE: mill owners, child labour and factory reform; Carpenter and Ruskin; radicals and nonconformists: Wesley, Ewan MacColl and the Clarion Cycling and Rambling Clubs. John Bull lived in Hayfield and Glossop in the High Peak for thirty years. He was a member of the Peak National Park Authority and chaired its Planning Committee between 1997 and 2004.